It was my original intention to create a night scene for "Sakura" that used some of the same "bio-luminescence" from "Satori". I played around with quite a few different textures on the petals (see the blue Pickle Jar version here). BTW: The character on the lanterns translates to "cherry blossom". This artwork speaks volumes for 'peace', 'tranquility', and 'balance'. You nailed this one, pal.... Excellent...! The colors are so beautiful. The scene so tranquil. Imagine swimming among these lights. The depth and nuance draw me back to this piece again and again. The ephemeral nature of the lanterns as they float away, the fleeting beauty of the cherry blossoms: all is held for an eternal moment in this canvas. I keep coming back to this one. The best "reach out and touch it" renderings. After all the many years I've been here, this is my favorite. I've been a fan for a long time (lifer for several years now) and this is one of my favorite scenes. 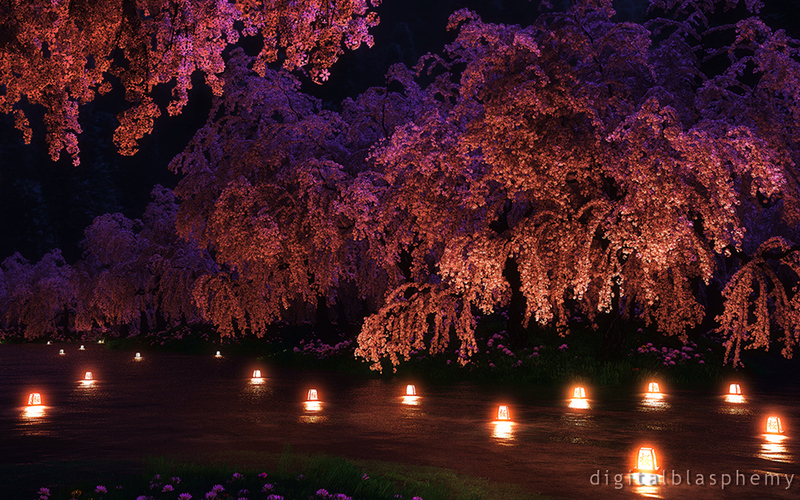 It's uncanny how the petals in the trees pick up the light from the lanterns. Fantastic. Keep up the great work! I've been a lifer for about 3 years and this is perhaps my favorite all around piece in your collection thus far! However, I have a bit of a background in plant science. Cherries are in the Rose family and one of the most distinctive family characteristics is that the flowers almost always have 5 petals. Perhaps this was modeled after one of the odd species where that's not the case? 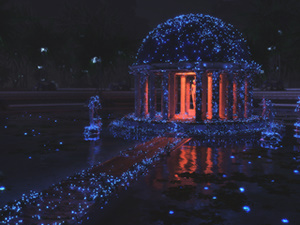 I love your night landscapes and this one is one of the best! The flower colors are so much prettier with the dark background and floating lanterns. In general I like the night papers, as they suit my working environment better. The 2560x1080 resolution seems to be missing, too. The lighting on the trees is breathtaking, but the grainy water reflections really ruin it. The water in the day version is much smoother. The 3360 x 1050 is available now! The trees and lighting are absolutely fantastic! It is so realistic. This is my favorite version of this image and one of my favorites of all time. Only extremely minor thing is if the water could be a little less grainy and more fluid or smooth looking with reflections of the amazing trees. This has got to be one of my new favorite pieces from you , Ryan. Its replaced the "Worlds Edge" series as my Windows login screen, which no wallpaper has done as of yet(until now). The lanterns just make the whole thing come together beautifully! Beautiful. Hope dual screen versions are coming. Rate this as one of your best, Ryan. And that's saying a lot. Well done. And a great idea. absolutely gorgeous. I agree, I like this even more than the daytime version. The only thing to possibly complain about is the water. It looks like shiny oatmeal and the reflections are off but it's totally beautiful regardless. thank you! I really love this piece, but I have a question. It seems to me that a lantern would reflect off the water in a circle all around it, not just in one direction as these do. Am I missing something? Anyway, it doesn't at all detract from the beauty of the work. I love the look. I personally think the lanterns look fine at that size. Smaller would cause issues with the one further back. I know with the nature scenes you like to to seasonal renders.Can we expect one with the flossoms falling in the wind? Any chance on widescreens versions. A much needed piece after the brown dry winter we've had! I even like the blue version, but the final is exquisite!! Definitely the greatest piece you ever made! Great work, Ryan. Love this version, clever touch with the lanterns (now that I know their meaning), plus they make for great lighting throughout the piece. Fantastic! I should have mentioned it in the notes. The character on the lanterns means "cherry blossoms". Gorgeous, as always. I'm curious as to what the character on the lanterns means. My usual preferences with your art are the blues and purples, but I couldn't pass this one up. I love the orange close to the lanterns then fading to pink in the background, very nice! Ryan, can you tell us the meaning of the Japanese character on the lanterns? This is one of my new all-time favorites, certainly my top spring choice. My students at school want to know where you took this picture. Absolutely beautiful work, Ryan. This is very nice! I agree that it's better than the day version. But just pink for night variation and not blue. What do think? I have a few minor quibbles, but overall I love the night render even more than I love the day version. The idea of lighting the trees from lanterns in the river is genius, but I think the lanterns are a bit too bright or too large or something -- they're just a little too prominent. Also, the blossoms closest to the lanterns have an orangish appearance that isn't as attractive as it might be. Other than that, it's great -- another winner, Ryan! I usually don't say much, as I am a long time fan of all your work, but this one stood out for me to comment and say what a beautiful job you did with this. It reminds me of some of the little hole in the wall parks that dotted Tokyo, while I was stationed in Japan. 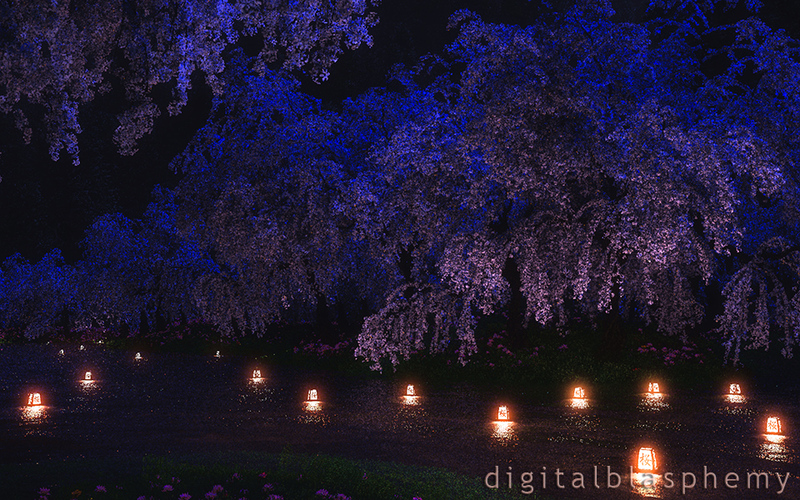 Here is a quick and dirty render of the blue blooms at night. I think if I was going to do another render of this (remember this one took 66 hrs) I would probably do more smaller lanterns. Something about them doesn't look perfect to me either. Gorgeous! I also am limiting to 9 only for the geometric appearance of the layout for the lanterns. On the other hand...if you ever decide to light up your pickle jar blue version, I will probably have to order it as a print. Because it's all kinds of beautiful. The only reason it didn't get a 10, strange as this sounds, is due to the organization of the floating lanterns. It seems too grid-like or something. This is just awesome looking. the idea for the lanterns was genius! have you tought about doing a night version of the Blue Sakura? I bet that would be cool, too! OH WOW! The only thing I would change is the small cluster of lamps in the left background. In larger images they seem... out of place. Otherwise this a gorgeous use of lighting! Loving this. Love the floating candles. Can't wait for the mutli-monitor ones. My first thought when seeing this was "Oh, Wow!" A very nice piece, and I wouldn't change a thing. As soon as the multi-monitor renders are available, it'll be my wallpaper. Now we're cookin' with oil! The blue version would also be great at night. Thanks again. I think the title is a little harsh... the whole scene is fantastic, I really like the two day versions. The idea with the floating lanterns is great as well, but personally, I think that for lit candles they shine a little too bright. It's hard to make out the inscriptions... would it be possible to turn down the brightness of the lanterns a little bit and maybe try to keep some of the light by illuminating the trees from above by the moon? I know you explicitly mentioned the intention to illuminate the scene from beneath, but I think the trees could do with a little silver light from above. ;) Thank you for these lovely images! Awesome piece. I know have this set to the lock screen wallpaper on my Galaxy S4 and the day time version as the background of the home screen after it's unlocked. It makes for a nice transition. You took an already amazing piece of artwork and made it even better! Thank you for this. I was born and raised in Japan, and this really hit home (more so than the other two). Fantastic. Oh my goodness....Ryan outdoes himself yet again.